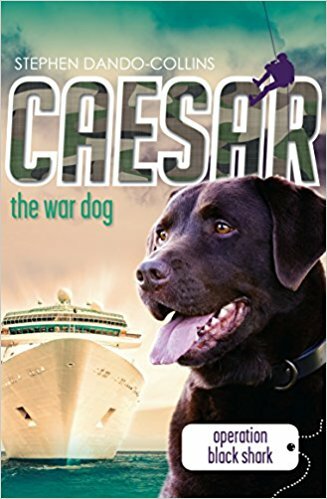 When Sergeant Ben Fulton’s family joins him on a cruise ship holiday, Ben, Josh, Maddie, and Nan travel in luxury among the islands of the Caribbean while Caesar is in quarantine. But a gang that has broken out of a Cuban prison have other ideas. They hijack the massive ship and hold its 3,000 passengers for ransom. With passengers of all nationalities in danger, only the United Nations can step in to help. Ben’s best friend Charlie and the rest of the GRRR team quickly assemble. Charlie will need super-sniffing explosive detection dog Caesar with him as he parachutes in to sneak aboard the ship. Will Caesar and Ben be reunited in time to find the hidden explosive devices that threaten the ship? Can Operation Black Shark capture the modern-day pirates before it’s too late? Prior to writing this book, Stephen spent time aboard cruise ships in the Caribbean - a tough job, but someone had to do it! While on board, he spoke with captains and senior officers to learn as much as he could about cruise ship operations, learning lots of fascinating facts. For example, did you know that the ships of major cruise lines retain all their waste on board? They don't dump it in the ocean; they offload it back in port for disposal onshore.